My girls Nicole (left) and FBG Tish (middle) and me, all wearing our hats! Music festivals are fun. And Coachella in sunny Indio, Calif.? Well, it’s a hippie love-fest of good tunes, sunshine and interpretive-dance opportunities. Unlike when FBG Tish and I went last year, which was in the 90s, this year the temps soared past 100 degrees. In fact, on day three of the music festival, the high was 107. Do you guys know how hot that is? Even with the dry heat in the desert, it’s BLAZING. So, instead of just generally talking about how Coachella 2012 was (for the record, freakin’ awesome—and Tish will share a few of her fave bands and songs for working out next week), I thought I’d share a few lessons learned. You know, lessons that kept me from being an overheated, sunburned mess. I still can't believe how delicious this tasted at 3 p.m. at Coachella. 1. Drink like a mo-fo. And by “drink,” I don’t mean alcohol. Actually, you’ll want to avoid alcohol like the plague, as it’ll dehydrate you and the name of the game is Stay Hydrated. I had a mimosa before going into the festival on day two, and pretty much regretted it as soon as I stepped on the sunny festival grounds. 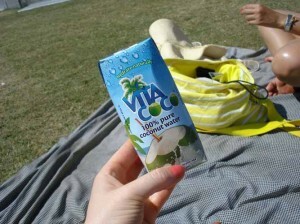 I found a rotation of drinking water, then a sports drink and the occasional coconut water to be best. Oh, and be sure to hydrate plenty before and after you’re at the music festival, too. If you can start and end your day hydrated, you’re much better off for that day and the next one. 3. Love the sun. But don’t be an idiot. Yes, it’s so hot that you’d rather not wear clothes at all, but we saw some badly sunburned people that just looked painful. Cover yourself with sunscreen—the spray kind worked best for me, as it wasn’t impossible to put on when you were sweating—wear a hat and grab shade when you can. A number of the bands who are damn good play off the main stages and under tents at Coachella. These tents not only allow you a more up-close-and-personal show, but also feel-good shade. 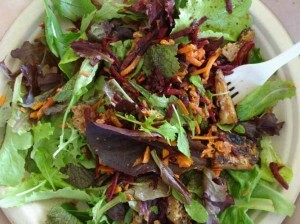 An organic tempeh and beet salad. Coachella loves the healthy foodies out there! 4. Eat healthy if you can. But just eat. Being that it’s Cali and all, I found a number of good, healthy options. There was gluten-free and vegan Indian food, tofu, freshly pressed organic juice, fresh fruit and even salads to eat. So you can eat pretty darn healthy when you’re there. Although, I’d say the major thing to remember is just to eat…something. When it’s that hot, it’s easy to skip a meal, which is exactly what you don’t want—passing out from the heat and lack of energy! So eat regularly! 5. Dance like no one is watching. For me, the best part of Coachella 2012 was listening to good music, gazing at the mountains and dancing like crazy. That’s part of what makes Coachella so endearing—just about everyone is dancing a fool. So don’t worry about what others might think of your dance skills (believe me, they’re probably too high to notice or are staring at the half-naked chick dancing a few rows back); move to the rhythm and enjoy it! Also, if you’re going to a music festival as a vacation like I did, consider this your cardio. I managed to squeeze in some push-ups and lunges at the hotel, but dancing and walking the festival grounds was pretty much my activity for three days!